In this group, you will discover the level at which you have been listening and learn to listen more deeply to discover the fuller messages of both life and the people in it. Listening deeply&truly is totally necessary if we are to be truly intimate with ourselves, our experiences, and our beloveds. Remote Participants: If you join via livestream, it is recommended there be another participant with you for the main exercise. However you may still join on your own. Further details shared upon confirmation of your participation. Recent blog post and newsletter by Sky on listening is here. 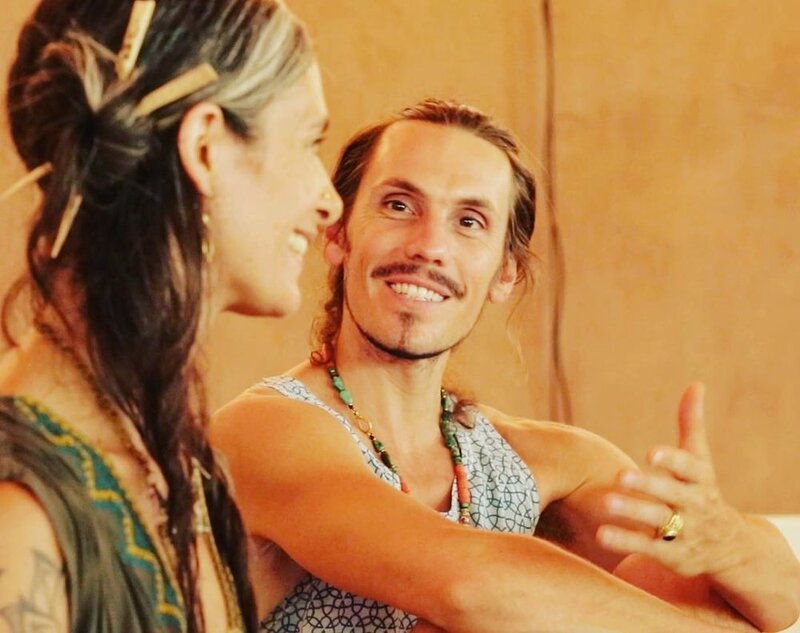 Dive deep within and connect into the wellspring of divinity, wisdom, and celebration that lives inside of you, in this intimate and transformational workshop. We will be meeting under the blessing of the full moon and drinking a medicinal dose of pure Mayan cacao to enrich the experience! Self-connection could only ever mean connection with the Divine, and that includes empowerment, magic, and joy--and also: authenticity. In this workshop, we will explore how by diving deep into our vulnerability, we unlock the key to our sense of Self-connection.. and for that, the key to empowerment. We will move beyond the conceptual phase of empowerment and into a real-time body-mind-soul integration. Guided by Sky, we will dive deep into ourselves, into whatever is present within us at the moment. If pain is stuck or present, it will be welcome to the surface to be released and moved through. If confusion or uncertainty is here, it too will be welcome to rise and clear. If we're bubbling with joy, excitement, celebration--that, too, will be given space to be embodied and lived. Everything is welcome. Whatever is within us that has been blocking the way to us deeply sensing and anchoring in our truest self -- and whatever is within us that is ready to anchor and bloom -- that is where we will be guided to go. Yes: we will be clearing our channels through movement and sound, through ritual, through somatic prayer, as we make our way back home within ourselves. and close the day feeling more connected, grounded, and confident in our power and our truths. Shifted and transformed. This workshop is meant for women who are inspired to explore, deepen, and enjoy the juiciness of themselves and their life. Five Women is a rare opportunity to journey deeply into Self-connection and empowerment with Sky and just five other women in an intimate and safe space. Furthermore, it is a space that is greatly alchemized by the power of five women coming together in this true and profound way, which has a power of its own that will carry us all. *Rarely is a workshop this small, and therefore this intimate. * Fueled by the power of the full moon. $50 per person for the entire day. Click the button to hold your space. Catch Tehya Sky live at Lucidity Festival on April 9th, from 12:30pm-1:30pm at the Community Networking Hub! Tickets available here. What does it mean to live all of life as "ceremony," as "the spiritual practice itself?" Why don't we already do it, and how may we begin to orient ourselves into this sacred way of daily life, where the mundane and the challenging are just as prized as the profound and the blissful? In this talk, Sounds True author of "A Ceremony Called Life: When Your Morning Coffee Is as Sacred as Holy Water" and metaphysical guide Tehya Sky guides us into considering how we may live the expanse of our human lives as sacred ceremony, as a ritual worth giving all of our attention and appreciation to; and how we may work with each moment of life to uncover the gifts that are before us. Join me for this evening workshop at East West Bookshop in Mountain View, CA. In this workshop with Tehya Sky, we will deeply consider what it means to show up with presence and accountability for all of life: from arguments with our beloveds and the challenging times we live in, to waking up each day with a prayerful orientation for the beauty we are invited to live. Together we will navigate our way into the power of choice we have to cultivate a meaningful curiosity for all the moments of life, as a way of living life as we truly intend to, knowing ourselves more truly, and creating the good visions of our hearts. Join me at East West Bookstore in Mountain View, CA for this free talk on Sunday, Jan. 22. Later in the day, we will continue with a workshop, link here. Please call (650) 988-9800 to reserve your spot. Come discover how life transforms when we begin to regard all of life as sacred, as the spiritual practice itself. In this talk, we will explore how–through this way of walking all of life as the ceremony it is, and by showing up each day with presence and accountability– we begin to discover the meaning within all moments, from the sweet and miraculous to the challenging and the mundane. To reserve tickets, please call 650-988-9800. Welcome to the second gathering of our women's circle. This is a sacred circle of sisterhood, of prayer, intention, healing, and love that will be led by Tehya Sky in her home in Mill Valley. All are welcome. Sisters, for our second meeting, let's gather around the altar to open the gates of the new year together with power, intention, clarity, and togetherness. This full moon's sisterhood circle will be an interactive one. Last month's first circle was primarily led by Sky as she took us through ritual, and this month we will focus more on connection, expression, and the magic of the circle. For this first full moon of 2017, we will be focusing on setting the tone of the year. What that means is that we will work with the magic of the circle to set forth our intended energy for the coming year, as a prayer and as a strong way to enter the gates of 2017. What is this "magic of the circle" that you keep reading about? Something incredible happens when we gather round and share. Each person's expression tends to directly speak to the heart and soul of other women in the group, and the guidance that they channel for themselves through their sharing and the chain of sharings it inspires is often exactly the medicine needed for other sisters in the circle too. Together, we will welcome in this year new with grace and heft. This is not a year for playing around; this is a year in which we are all called to stand up straighter than ever before, with our feet more firmly on the ground than ever before, with our roots more deeply planted into Mother Earth than ever before... with our voices ready to speak and resound their truth, more so than ever before. And so we will enter the gates of this powerful embodiment together, the way sisters do, the way women do when they hold each other hands and let their wisdom shine. This is an open group welcome to all, free of cost. A handwritten letter, composed beforehand, which expresses the tone you feel called to embody this new year. Please request your space below as space is limited; (last month, the circle was full). You will receive an email confirming your place within 72 hours. *Note, we may at some point live webcast this gathering so women from all over the world can participate from afar, so if you are not local to the San Francisco Bay Area, please feel welcome to sign up below. You will be notified if the groups are shared live, online. Welcome to the first gathering of our women's circle. This is a sacred circle of sisterhood, of prayer, intention, healing, and love that will be led by Tehya Sky in her home in Mill Valley. All are welcome. Please click here for full details. I'll be hanging out at Yoga Works in Larkspur, CA on Sunday, August 28th, to meet you, talk with you, and sign your book:) Come one, come all, and take one of their beautiful classes over there! The studio is so sweet. Join us in a gypsy wonderland celebration of "A Ceremony Called Life"'s release! Tehya Sky's first book is being birthed on July 1st, and we're gathering to send it off into the world the only way we know how: chocolates, teas, and music. We will enjoy a medicinal dose of cacao, listen to live grooves by BJ Dubin, and be graced by the offerings of the tarot goddess Cristhal. It will be a gentle but deep and savory evening peppered with sharings from the book, the support of good live music, expanded heart openings,, and guidance from the tarot. We will begin by drinking a medicinal dose of the Mayan medicine of Cacao. Cacao is a powerful heart opener and, when eaten in proper dosage, brings about a strong enhancement of the moment. From there, we'll have a moment to sit with the effects and watch them take place within us, perhaps talk with friends, or just follow that energy wherever it takes us. BJ Dubin's music will weave into the scene once we've been with the cacao for a bit. Throughout it all, we're welcome to journey over to Cristhal's table for a private donation-based tarot reading. All of this magic will happen in the love-nest that is Wu Wei Temple in Fairfax, CA, where all things tea, drinking chocolate, and liquid alchemy merge with the good vibe of amazing souls. Come one, come all. This is a free event, though donations to support our musician are appreciated! More events being added soon! where I will lead us in a spiritual circle of conversation and engagement. We will go deep, and there will be time for questions and responses. This is an intimate event with very limited space, so please RSVP ahead of time to save your space. There will be an anonymous pay-what-you-like donation bowl where you may contribute whatever you feel for your attendance, (the suggested donation is $15-$30). Tea will be served; please bring your own mug. RSVP ahead of time to reserve your space: hello@tehyasky.com Address and further details will be sent to you via email upon confirmation of your attendance. If you feel inspired to host Sky and organize a salon at your home, please write to us and share your vision. Reawaken your most wild and true heartbeat in this transformational one day "somatic prayer" workshop where we move into a deep exploration, remembering and awakening of our truest prayer, magic and power... and how to hold it in the body in full integration in this life. We will be drinking a medicinal dose of pure Mayan cacao to enrich the experience!